Heaven 17 never toured when The Luxury Gap album first came out even with it being their most successful album. It contains masterpieces such as Come Live With Me, Let Me Go, We Live So Fast and of course their most well-known track, Temptation. To hear it played live is an experience that should be on everyone’s bucket list. This is a phenomenal show and Glenn and Martyn know how to throw a party. The London leg of the tour was hosted at Shepherd’s Bush Empire – a favourite venue of the band. The tour is currently over halfway through and yet on this cold November night, London came out in droves, queuing up to see these 80’s legends. 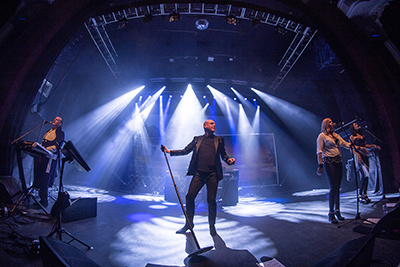 The audience were rewarded by Heaven 17 telling them that they were the best audience – apparently even better than Liverpool. The audience lapped it up.